The key to a simple and stress-free move begins with proper planning and good organization. At U & ME Moving in West Palm Beach, we are more than happy to step in and take care of it! We’re packing specialists trained to execute the perfect packing job each and every time. Our professional and trained packing team will take the utmost care in packing all of your personal and delicate belongings. Following the packing process, everything else should fall into place fairly easily. However, how your valuables are packed goes a long way in saving you money and time during the move. At U & ME Moving, we make the transition time and unpacking time significantly quicker when you get to your new destination. Our movers know how to move an entire household or office with care and accuracy. Keep in mind that inadequate packing could mean that even the most experienced moving company will require extra time to move all of your belongings successfully. Since time is money, when it comes to moving, you’ll save hassle and headaches by teaming up with us at U & ME Moving. Take advantage of our packing services; it’s worth your while! 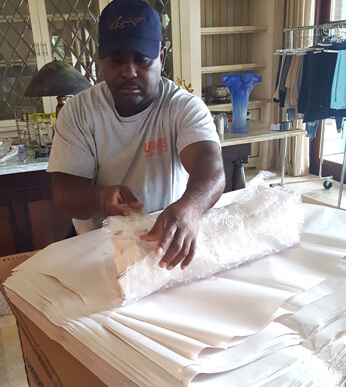 Our packing team uses professional packing materials to protect your valuable items, including specialized cartons, recyclable paper, micro foam, plastic wrap, bubble wrap, and reusable quilted moving pads. Any fragile belongings such as artwork, picture frames, marble and glass tabletops may require the special care and attention we can provide through our custom wood crating. Each crate we use is built by our crews to the exact specifications necessary to protect your delicate valuables. crating needs. Custom crating is done on-site in our warehouse based on special needs. Careful packing techniques can be requested for international shipping services. Convenient packing solutions that save you quality time and money. Thinking about doing your own packing? If you wish to do your own packing, we also provide every size box imaginable as well as all other packing materials. When you think about the time it takes to pack, think about all the time U & ME Moving can save you. U & ME uses the highest quality materials available and we guarantee that all your items arrive at their destination in the same condition they left in. Have specialty items that aren’t quite as easy to move? Some items require more than just a moving truck. Fortunately, we can accommodate all of your moving needs, including those that may require specific machinery and handling. Our team is equipped with the skills and machinery to ensure the job is done safely and in a timely manner.